(Photo by Mollie Corbett Photography) The Outlets at the Louisiana Boardwalk. 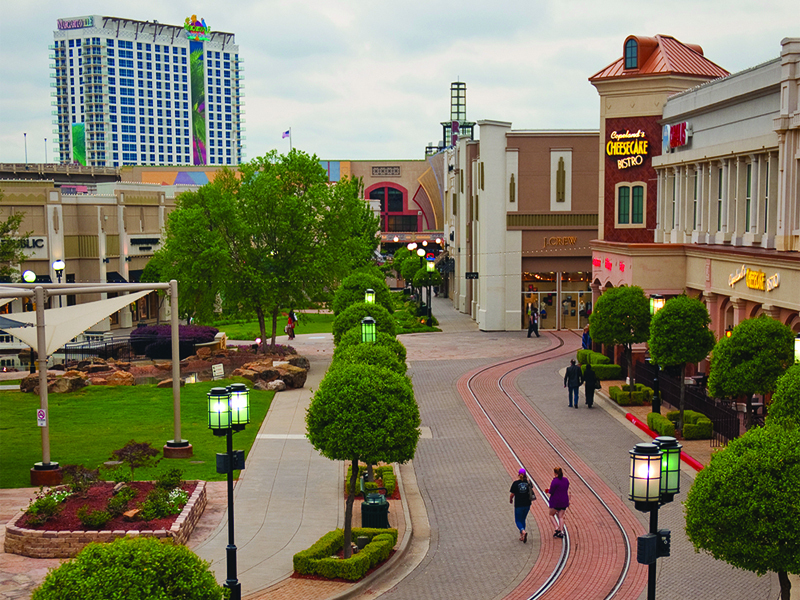 In May 2005, Bossier City invested $36 million into a forward-thinking attraction aimed at improving quality of life in northwest Louisiana and luring more tourists to showcase what Shreveport-Bossier has to offer. That investment was the Louisiana Boardwalk. Various stores, restaurants, attractions and even property owners have come and gone, but the all-in-one retail-dining-entertainment center on the edge of the Red River has had a staying power that pays dividends to local entities and boosts our area’s overall image. “Not only has it been a commercial success, but it’s been a success for our city in terms of sales tax revenue that is very important for a our General Fund [Ed.’s note: which averages $5.7 million, according to Bossier City Information Officer Mark Natale],” said Bossier City Mayor Lorenz “Lo” Walker. “Recent research showed that in 2012 and 2013 it was the number one activity for visitors who aren’t coming for gaming, and even those who came for gaming, half still went to the Boardwalk,” said Stacy Brown, president of the Shreveport-Bossier Convention and Tourist Bureau. Pam Glorioso, Bossier City project coordinator, remembered the grand opening and the rush as hundreds of people worked up to the minute to make the deadline to cut the ribbon. Brown, who began her career with the Convention and Tourist Bureau in 1994, has a unique perspective of watching the market grow and develop more and more, adding that everything in the tourist industry tends to “build upon one another.” She said at the time of its conception, there was no doubt in her mind that the Boardwalk would be a hit. “As someone who travels to conferences out of town, I often go shopping. And with that experience, I can tell you having the Boardwalk so close to other hotels and the convention center is a key to its success. For people who are staying near downtown or other attractions, it’s very easy to shop and dine,” Brown said. Brown said the Boardwalk is a “tremendous addition” for visitors, the value being the shopping destination becomes just that — a true destination. “The importance to the gaming can be really seen in other markets. Tunica has seen decline, Indian casinos in Oklahoma have a limit on length of stay of the visitor. By having the gaming and strong non-gaming component, we have the best of both worlds. It gives them another reason to come back to our market,” said Brown. The center has gone through several changes in its 10 years. Developer and initial operators the Good Company sold the Boardwalk, which eventually came under hard times when O&S Holdings defaulted on a $128 million mortgage and lenders took control of the property because no bidders came forward at a foreclosure auction in 2011 when it was under Bayer Properties’ management. J. E. Robert Co. then bought the property for $80 million at a Bossier Sheriff’s sale. The Boardwalk was eventually sold to New York firm Garrison Investment Group in 2013. The owners then rebranded the open air shopping center as Louisiana Boardwalk Outlets with a new focus as an outlet center that still retained chain restaurants like Buffalo Wild Wings and entertainment draws such as the Regal Cinema 13 movie theatre. “It’s had some growing pains like any shopping center has, but now the Outlets are transitioning the stores to fit their model. They’re slowly doing that and I think it’s a complete success,” said Walker. Request for comment about the current viability and future of Louisiana Boardwalk Outlets from current management was not returned in time for BIZ. Magazine’s deadline. But the property’s major anchor tenant since the Boardwalk’s inception, the Bass Pro Shop, said they have seen solid sales since 2005 and don’t see it slowing down. It’s a sentiment that is shared by local officials. Brown noted the Boardwalk’s growth and evolution with the success of the Courtyard Hotel at the Boardwalk, and their latest neighbor —Margaritaville Resort and Casino — seeing a boost from its close proximity to the shopping mecca. “Visitors want to do more than one thing, so if you make it easier to get around they will go,” Brown noted. “It has done all sorts of things that lends itself to being a permanent fixture and complements things we’re hoping to do to upgrade Old Bossier. I look forward to it being here for quite a while, yet,” said Walker.